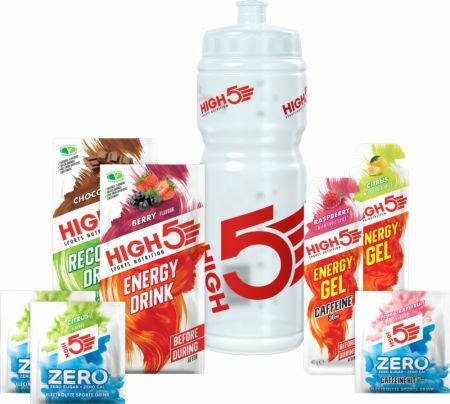 The HIGH5 Starter Kit is an easy and convenient selection of sports nutrition products to get you started on your training and racing. It’s a great way to try out the HIGH5 range and find out which products work best for you. How do I use the Starter Kit? You can take the ZERO tablets, Energy Drink and the Energy Gel products both before and during your training or race. For ZERO, drop 1 tab into 750ml water and you’re ready to hydrate. The Energy Drink 47g sachet should be mixed with 500ml water and the Energy Gels can be consumed straight from the sachet as needed. Recovery Drink is for consumption within an hour of finishing intense sport to restore depleted carbohydrate stores and deliver protein to your muscles. Mix 60g with either water or milk. No Starter Kit Reviews Found. Acidity Regulators (Citric Acid, Malic Acid), Sodium Bicarbonate, Firming Agent (Sorbitols), Magnesium Carbonate, Sodium Citrate, Potassium Citrate, Natural Flavourings, L-Ascorbic Acid (Vitamin C), Calcium Carbonate, Sweetener (Sucralose), Maltodextrin, Leucine, Green Tea Leaves Extract (Camellia Sinensis O.Ktze), Sodium Chloride, Colour (Riboflavins). Dextrose, Whey Protein Isolate 30% (Milk), Maltodextrin, Fructose, Cocoa Powder 9%, Stabiliser (Carrageenan Gum), Emulsifier (Soy Lecithin), Natural Flavorings. Directions For Starter Kit: Follow directions on each pack. Warnings: Note: Some products in the Starter Kit contain caffeine. Not recommended for children or pregnant women.